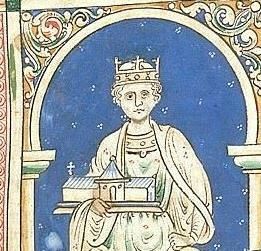 Henry II ruled as King of the English from 1154 to 1189. He was also Duke of Normandy and Aquitaine, Count of Anjou, Maine, and Nantes, and Lord of Ireland; at various times, he also partially controlled Wales, Scotland and Brittany. Henry was an energetic and sometimes ruthless ruler, driven by a desire to restore the lands and privileges of his grandfather Henry I. During the early years of his reign the younger Henry restored the royal administration in England, re-established hegemony over Wales and gained full control over his lands in Anjou, Maine and Touraine. Henry's desire to reform the relationship with the Church led to conflict with his former friend Thomas Becket, the Archbishop of Canterbury. This controversy lasted for much of the 1160s and resulted in Becket's murder in 1170. Henry and Eleanor had eight children. As they grew up, tensions over the future inheritance of the empire began to emerge, encouraged by Louis VII and his son King Philip II. After several civil wars against his wife and his sons, Henry was defeated and retreated to Chinon castle in Anjou. He died soon afterwards from a bleeding ulcer and was succeeded by his son and enemy, Richard I.